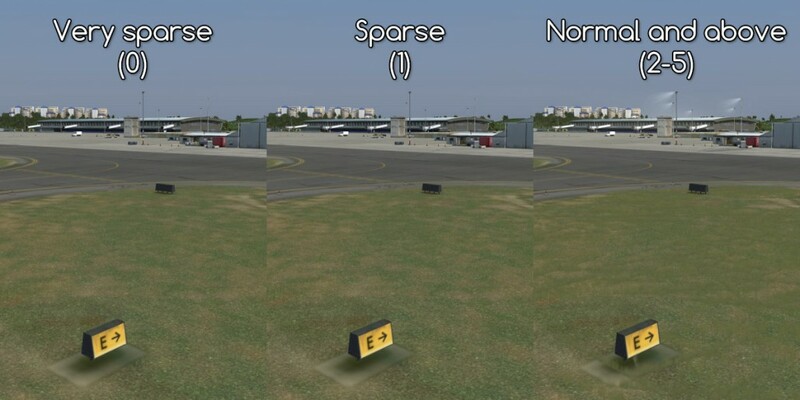 IMAGE_COMPLEXITY code in fsx.cfg shows the position of the Scenery complexity slider in FSX settings. The main reason for this setting was to allow scenery developers to build sceneries with adjustable complexity. Each object would appear only if required level of complexity was set. In theory – a scenery would be scalable and user would be able to adjust it’s complexity and it’s load on his PC. If you test a default scenery at various Scenery complexity setting – you will see a difference. Not so much with payware sceneries. I tested several and I never noticed more than three levels of complexity. Take a look at this examples. To spare your time I’ll share my observations. There is no difference between 2 (Normal) and 5 (Extremely dense). If you set Scenery complexity slider to Sparse (IMAGE_COMPLEXITY=1) 3d lights and 3d grass will disappear. 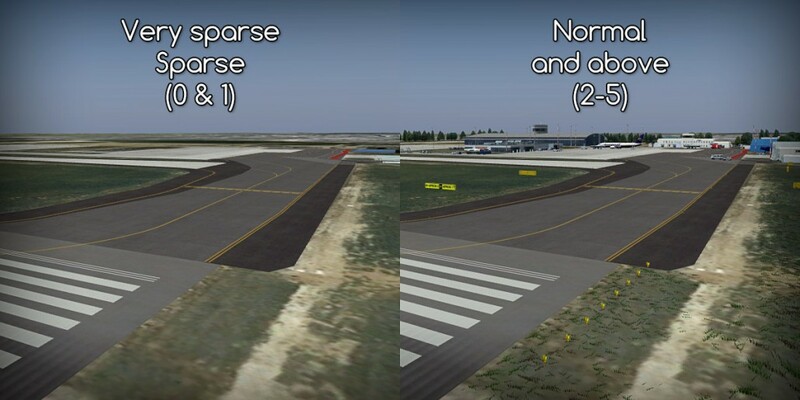 Set it to Very Sparse (IMAGE_COMPLEXITY=0) and parts of the jetways will disappear too. In terms of scenery performance and load – there is not much of a difference between 1 and 2 and I could not see a slightest difference in performance between 0 and 1. As you can clearly see – the difference is huge! It’s just an empty scenery with only ground textures left at Very sparse and Sparse settings (IMAGE_COMPLEXITY=0 and =1). At or above 2 (slider position between Normal and Extremely Dense) there is a complete scenery. It depends on the scenery you use. There may be some sceneries that actually use this setting to improve performance in the way it was intended. Further test would be necessary. What Microsoft tried to achieve with this setting is usually realized with scenery configurator tool that allows to turn on or off the features that cause excessive load. Until you encounter problems with a scenery that actually use all this levels and includes some heavy objects at Extremely dense setting – you should stick with it just to make sure that you see all the objects in the scenery.